At a threshhold of under $180 we think the best cheap BBCOR bat is Louisville Slugger’s 518 Omaha. If your looking for a sub $100 price point, and want to stay new, then we suggest the BBCOR Rawlings Prodigy. At under $100, we would scour the used markets on eBay to find an more top shelf bat from year’s past. But, turns out, there are a lot of options in the cheap BBCOR space. Used Or New Cheap BBCOR Bat? Do you want a new cheap BBCOR Bat? 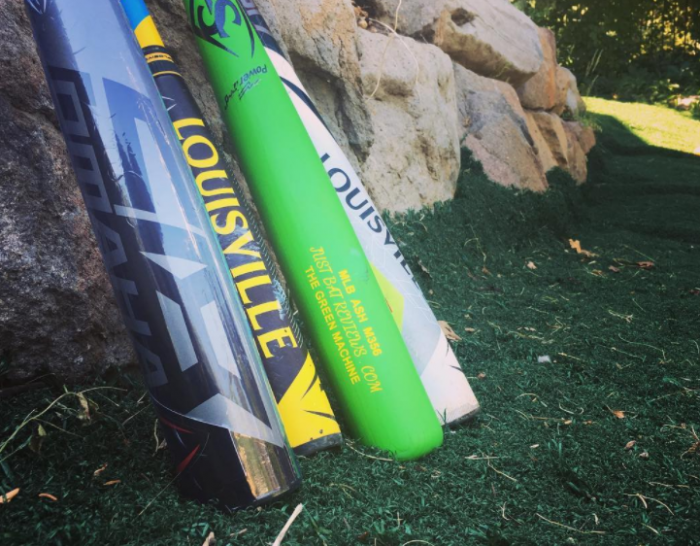 Although the used BBCOR bat market can scare many first time buyers off, we think it a great place to get a quality bat if your budget is less than $100. In fact, as we talk about what to buy when, looking for a top end previous year’s BBCOR bat model in October is a great strategy. Finding bats that sold for $300 just a few months ago at a sub $100 price point is common place. Here is our favorite eBay search for a used BBCOR bat under $100. When you accept that strategy, of buying a used BBCOR bat for cheap, then the world is your oyster in terms of the best BBCOR bat. We suggest you look at older models found on our best BBCOR bats page. A stiff BBCOR bat delivers more power to the ball. The 518, if anything, is a very stiff bat. This stiffness delivers full power transfer to the ball. Good hitters love that. For an aluminum bat it maintains a very good sized barrel. It does not have the oversized corndog feel of more top end bats, but the bat looks and feels like a traditional bat. The swing weight on the BBCOR 518 is considered balanced. That means, roughly, the weight of the bat is distributed evenly throughout the bat and, as such, makes it a pretty quick swing. Legit BBCOR players prefer this type of swing weight. Our full review of the 2018 518 Omaha discusses many more features. In short, it prices out at a fraction of the price that other bats, much like it, run for. We have been big fans of the Omaha line since its resurgence as the 515 in 2015 and have no doubt it is the best selling line of Louisville Slugger’s performance edition bats. If you’re budget is sub $200 and you’d like a new BBCOR bat you should have a hard time passing on the 518 Slugger. In terms of a new BBCOR bat under $100 your options are very similar. Every sub $100 new BBCOR bat we could find is produced in a single piece aluminum made from a pretty basic alloy. In terms of feel and performance we had a very hard time discerning between them. Basic aluminum alloy bats, regardless of the paint job, feel like basic aluminum bats. Barrel size is similar, feel is simliar. The only thing, aside from the colorway, we could manage to make a determination on is the grip feel. But, considering a top end Lizard Skin is less than $13 these days it’s hard to consider that seriously. That said, if we had to make a determination we’d choose the Rawlings Prodigy. Our hitters like the perferated grip and the balance felt right. At less than $90 we thought it as good as any other option out there. Easton has a few sub $100 aluminum bats on the market. As they get closer to that mark they simply upgrade the alloy. This upgrade in alloy tends to deliver a slightly larger barrel as well as more durability. The S650 stands as the top of the cheap guys. And, like the Rawlings Prodigy above it, is as good as you’ll find the cheap BBCOR new space. How Much Should I Spend on a BBCOR Bat? Over the years we’ve derived a rule as to the maximum amount you should spend on baseball bat. It takes the number of games you intend to play with the bat and multiply it by your age. For example, a 14 year old expected to play 20 games with their BBCOR bat should pay no more than $280 for their bat. We’ve found this equation tends to overstate the amount older players should play. And, as such, we are not sure how useful the equation is at older ages. For BBCOR players, it is very difficult to know how much better a more expensive bat will improve your game until you use it. Better hitters tend to benefit from a more expensive bat less. Or, said differently, the better you get the less the bat matters. No matter what you decide, and if you’ve made it this far in an article like this, you’ll have plenty of options to choose from.